Junior Dillon Lewis, left, plays Mary Todd Lincoln and junior Chase Hardin plays 16th president in Beta Theta Pi's musical "My Dear Lincoln." 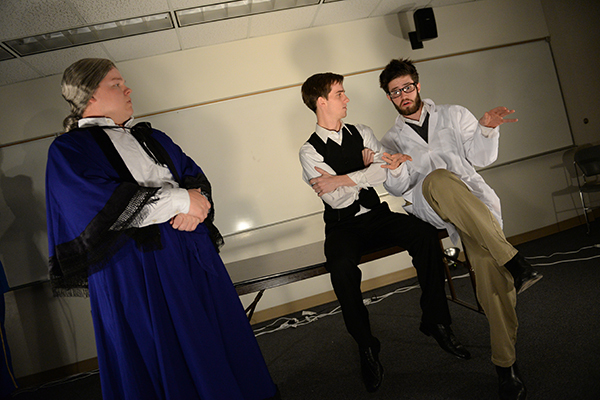 Junior Michael Morgan, right, plays a crazy scientist. Updated April 17, 2014 at 3:10 p.m. When senior Colin O’Brien stood up at a Beta Theta Pi chapter meeting and told his fraternity brothers that he wanted to direct them in a musical, he received laughter and skepticism. Not only did he want the social fraternity to sing, dance and act, but he wanted members to perform in a historical-fiction musical that he wrote called “My Dear Lincoln,” which depicts a schizophrenic Abraham Lincoln as he struggles to keep the country united while enduring bizarre visions of Gen. Robert E. Lee. Over the last seven weeks, O’Brien convinced his fraternity brothers that a musical performance – even one that’s a little unorthodox – could change how the campus thinks about Greek life. While rock bands or DJ duos made up of fraternity brothers may not be unusual, O’Brien believes the April 19 performance will be the first time a social fraternity at GW has put on its own musical. O’Brien and 13 other members of the fraternity launched a Kickstarter campaign to pay for promotion, set design, costume design, audio recording and video. The group raised $885 in a week with the support of family, friends and fraternity brothers, beating its $750 goal, though it hoped to raise $1,500. The play, which is free and will hit the Marvin Center Amphitheatre stage Saturday, presents a fictional side of one of the nation’s most celebrated presidents during the final days of the Civil War. 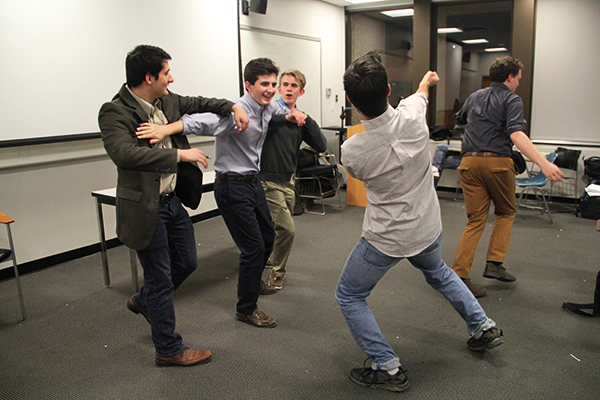 Members of Beta Theta Pi rehearse scenes for “My Dear Lincoln,” which the fraternity’s former president believes will be the first time a social fraternity at GW has put on its own musical. In one scene, Lincoln has a nightmare in which James Monroe, James K. Polk and George Washington argue over his abilities to keep the Union together, but instead of yelling, they’re singing. The promotional posters and Facebook photos for the show include male cast members playing characters like Mary Todd Lincoln in period-style dresses. “Musical theater isn’t everyone’s cup of tea, but there is plenty of buzz in the chapter about this weekend’s performance,” O’Brien said. The performance stands out among other Greek life events, like Fireman’s Challenge and Derby Days, which are focused more on philanthropy. Because the event is free, it won’t be used as a fundraiser. The musical is also a natural fit for Beta, whose national chapter calls itself the “singing fraternity.” O’Brien said he originally wanted to put on the chapter’s own version of a Broadway play, like “Rent” or “Jesus Christ Superstar,” but figured he wouldn’t have a big enough cast. Producing, promoting and starring in a theatrical production, even on a small scale, comes with hurdles. It’s been difficult to secure rehearsal space, and administrators even asked to screen the script for “controversial” material, O’Brien said. Even if the play is unconventional, junior Avery Jaffe, who portrays Lincoln’s archnemesis Gen. Robert. E. Lee, said he hopes the show will combat stereotypes surrounding social fraternities. In the 19th century and beginning of the 20th century, fraternities often put on plays and performed in glee clubs and orchestras, said Nick Syrett, an associate professor of history at the University of North Colorado who published a history of college fraternities. But close to the World War II era, things shifted.